This post is sponsored by Florida KidCare. However, all thoughts and opinions are my own. Whether you’ve been counting down the days or basking in the utter lack of routine this summer back to school time is here. Are you in the “omg summer couldn’t end fast enough” camp or the “how are we going to wake up at 6:00 am? !” club? Honestly, I am a card-carrying member of both fake organizations. Yes, we’ll both get way more work done when the kids go back to school next week. And they are excited to see their friends every day. But nobody is excited about the morning hustle out the door, car line, early dinners because of late practices, homework, or schedules. Every year we settle into the routine and master the school flow–once we get past that first week. I’m already having nightmares. Each morning for the last few days, I’ve woken up opening and closing my cramped hands. Hands aching from filling out the numerous back to school forms for my two kids. (I feel so bad for those who have more than two in school at the same time.) And then there are the forms I have to fill out because of my daughter’s medical conditions and allergies. School starts next week and this year I am determined to save myself some time by doing as much as I can before the first day. #1 Refill any prescriptions that your child may need at school. My daughter needs to have an Epipen and other medications at school. Furthermore, prescriptions cannot expire during the school year. This means that every year I have to get her scripts refilled at the start of the school year and medication forms have to be filled out for each one. Many scripts require doctor approval prior to refill (due to federal regulations). These refills can take a few days to process. When you think about how many parents have kids that need prescriptions refilled at the same time, the few days that it normally takes can easily turn into a longer wait time. Get the scripts filled the week before school starts so you have it in time. On the first day of school, I usually drop off the kids and then bring the medicine to the clinic. Or rather, I walk towards the clinic and get into the long line of parents holding prescriptions trying to get into the clinic. It’s a good idea to call the school and see if you can drop off the medications and forms before the students return. 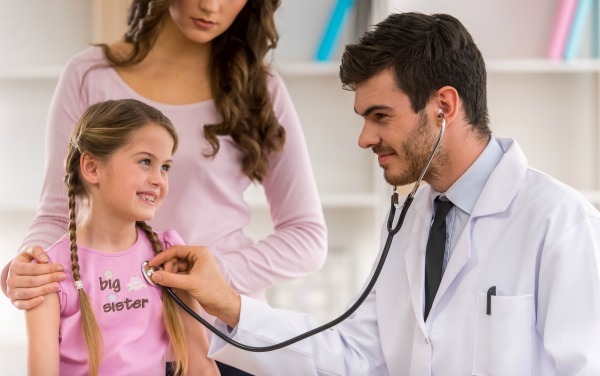 If your child needs any health forms filled out by their doctor, make the appointment as early as you can. When my oldest went to kindergarten, I didn’t realize the school needed specific forms filled out by his doctor. I ended up having to bring him after school started. Our health insurance has a time restriction on some types of appointments, like the school well check appointment. Because we are allowed one such visit in a year, I’ve been unable to schedule this appointment before school starts since that first visit five years ago! However, I can call and take the next available appointment slot once I hit that year mark. Immediately after school starts the appointments fill up. If you wait too long you might find it more difficult to be seen. You know what happens after school starts? Kids get sick. The fall is the perfect time to make sure the kids are up to date on their vaccines and preventive health care. Fall illnesses and sports injuries often send kids to the doctor. I’ve partnered with Florida KidCare because I am passionate about children’s health. If you live in Florida your children are eligible for health and dental insurance through Florida KidCare. I had no idea that Florida families are still eligible for for Florida KidCare if one or both parents work. In fact, even if you don’t qualify for free or subsidized health and dental insurance due to income, there are full-pay options open to families. Enrollment is open year-round so you can apply for Florida KidCare here at any time. Have doctors you love? Chances are that you can still see them with Florida KidCare. Health and dental insurance for kids are must haves to keep our families healthy. Did you know 283,000 children in Florida are currently living without health and dental insurance and 172,000 of them are eligible for free or low cost coverage through Florida KidCare? Are your kids living without health and dental insurance? If so, apply now for Florida KidCare. #3 Get as much paperwork as you can before school starts. Until our education system exits the dark ages of physical paperwork and put the forms online, the best we can do is ask for forms ahead of time. Our school nurse puts the forms into my kids’ backpacks on the last day of school. And for the first time in five years, I did not lose them! Schools are generally staffed during the summer. Ours is open Monday through Thursday. If you weren’t provided health forms, you can always stop into the office and ask for them. So yay to being prepared for back to school for once! (But boo to the germs and car line.) What do you end up wishing you had done ahead of time each year when school starts back up? I’m sooo over all the paperwork. Last year at this time I did a Facebook live calling for schools to finally go digital. I’d love for our son’s physicians to be able to update all of his information in one place vs. running around getting forms signed like a crazy person.